Product prices and availability are accurate as of 2019-04-14 23:35:12 EDT and are subject to change. Any price and availability information displayed on http://www.amazon.com/ at the time of purchase will apply to the purchase of this product. Anthony Davis is one of the top scorers in the NBA! 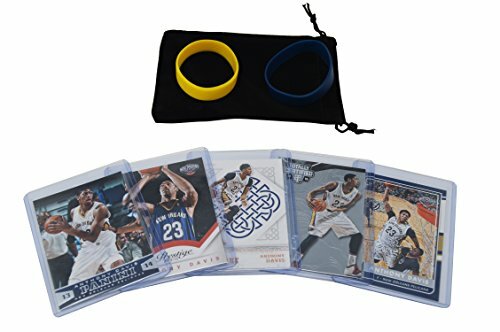 This lot of five 2012-2017 Anthony Davis basketball cards makes a great gift and collectors item for any Davis or Pelicans fan. All cards are in near mint to mint condition and are shipped with each card in its own individual soft sleeve and top loader or semi-rigid sleeve. Comes with bonus gift bag and two wristbands in team colors, making it the perfect gift for the young fan. WRISTBANDS AND GIFT BAG INCLUDED ARE UNBRANDED GIFT ITEMS AND DO NOT CONTAIN ANY DAVIS, PELICANS, OR NBA RELATED BRANDING, LOGOS, OR TEXT. CONTAINS - an assortment of authentic cards from manufacturers such as Panini, Bowman, and Topps COLLECT - These cards are a great addition to any Anthony Davis or New Orleans Pelicans collection. Exact cards per lot varies - please see pics for possible cards. WRISTBANDS AND GIFT BAG INCLUDED ARE UNBRANDED GIFT ITEMS AND DO NOT CONTAIN ANY DAVIS, PELICANS, OR NBA RELATED BRANDING, LOGOS, OR TEXT. IMAGINE SEEING YOUR CHILD'S EYES LIGHT UP - when they receive this cool gift of their favorite athlete. Each card has been removed from an original factory sealed wax pack, thus may have very minor wear, and comes individually protected in its own soft and hard plastic case. Most Davis cards are in Pelicans jersey, some may be in Kentucky uniform. Great gift for youth athletes. Your biy or girl will love them.